Cow urine concoction (CUC) is a local herbal preparation administered to children having convulsion in southern part of Nigeria. We investigated the effect of full preparation (FP) and modified preparation (MP) [without tobacco] of CUC and nicotine on the nerve-muscle preparation in common African toad, Bufo regularis. The result showed that nicotine significantly potentiated the contraction of skeletal muscle at lower doses, and at a higher dose the sensitivity of neuro-muscular junction was significantly reduced (desensitization). At lower doses of FP of CUC, the contraction of skeletal muscle was slightly increased than the nicotine but was not significant but the response was very similar to that obtained at higher doses. The finding indicates that nicotine and FP of CUC have something in common in stimulating muscle contraction. MP of CUC did not show any significant response at graded doses. It was concluded from the results that the therapeutic effect of this concoction might be due in part to the presence of tobacco or similar constituent in the cow urine concoction. The effect of „FP” of CUC in this study can be employed clinically in some disorders of the nerve-skeletal muscle system, like muscular weakness and hyper-excitability of the nerve-skeletal system, seen in children convulsion. Cow urine concoction (CUC) is a local herbal preparation administered to children having convulsion in southern part of Nigeria. We investigated the effect of full preparation (FP) and modified preparation (MP) [without tobacco] of CUC and nicotine on the nerve-muscle preparation in common African toad, Bufo regularis. 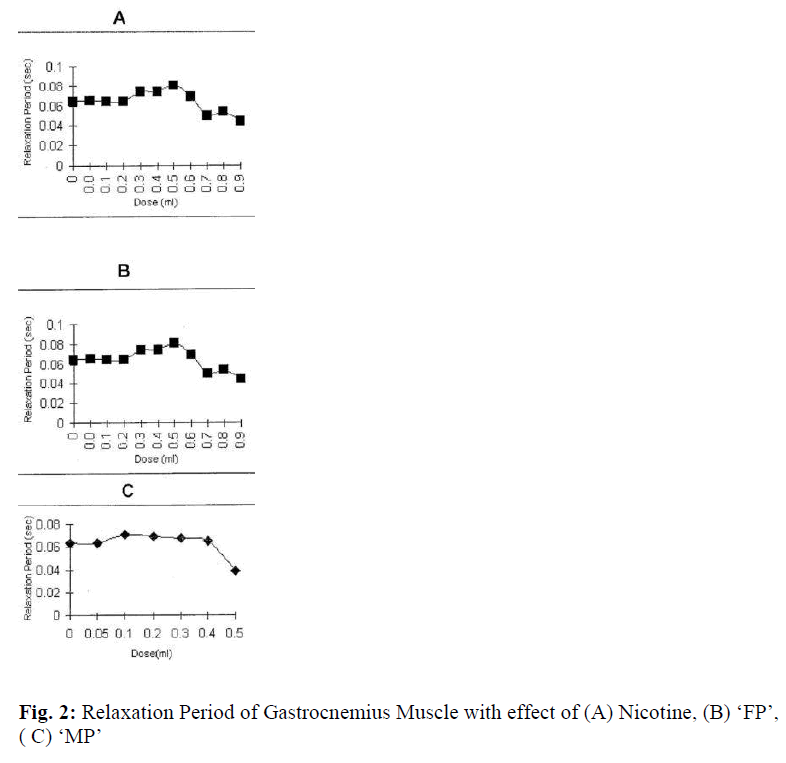 The result showed that nicotine significantly potentiated the contraction of skeletal muscle at lower doses, and at a higher dose the sensitivity of neuro-muscular junction was significantly reduced (desensitization). At lower doses of FP of CUC, the contraction of skeletal muscle was slightly increased than the nicotine but was not significant but the response was very similar to that obtained at higher doses. The finding indicates that nicotine and FP of CUC have something in common in stimulating muscle contraction. MP of CUC did not show any significant response at graded doses. It was concluded from the results that the therapeutic effect of this concoction might be due in part to the presence of tobacco or similar constituent in the cow urine concoction. The effect of „FP” of CUC in this study can be employed clinically in some disorders of the nerve-skeletal muscle system, like muscular weakness and hyper-excitability of the nerve-skeletal system, seen in children convulsion. For a long time traditional healers have been managing the disease and its prevention in Nigeria. Their practice includes the use of herbs, animals, concoction, minerals, and/or the use of rituals and incantations. The use of con-coction has survived the most. Cow urine concoction (CUC) is a kind of herbal preparation administered to children having convulsion in the southern part of Nigeria [1,2]. It is locally called “agbo giri” or sometimes “agbo tutu”. This herbal preparation is often administered in all types of convulsive seizure irrespective of their causes . The use of this concoction has resulted in death of many Nigerian children [2,3]. Cases of death from epilepsy of all ages following administration of this concoction have also been reported [3-5]. The concoction is prepared from leaves of tobacco, garlic and basil lemon juice, rock salt and cow urine, which. acts as the vehicle also contain other active principles . Over fifty chemical compounds have been identified in CUC. The major compounds are benzoic acid, phenyl acetic acid, thymol and nicotine . Also recent study reported that CUC has a depressive effect on the bile flow and it also significantly reduces the concentration of sodium and bicarbonate in bile . Since there is no experimental evidence of the concoction (CUC) on skeletal muscle contraction, present study was embarked upon to investigate its effect on nerve-muscle preparation compared to the effect obtained with the nicotine. We used toad’s neuro-muscular junction as an experimental model because it is a simple system where acetylcholine is the major neuro-transmitter released during synaptic activity. The full preparation (FP) and modified preparation (MP) of CUC were prepared in our laboratory using the method of Oyebola and Adetuyibi . Their various components are: galic leaves (allium sativum ameryllidaceae) 10g, tobacco leaves (nicotiano tabacumm solanaceace) 20g, lemon juice (citrus midica, var.acida.rutaceae) 25ml, basil leaves (ocimum virida habiatae) 16g, rock salt 20g, onion bulbs (allium, cepa, amaryllidaceace) 40g, cow urine 300ml. These ingredients were mixed and kept for four weeks . The MP was made up with the same ingredients as the FP except that tobacco leaves were absent. Previous studies have established that CUC stored at room temperature has a shelf life of well over 2 years . Common african toad Bufo regularis weighing between 60-80g was used. The toads were selected randomly into three groups of ten toads per group. Group I was treated with nicotine it serves as control. Group II had FP and Group III had modified CUC. The method described by Dasgupta and Muherjee method  was used for nerve-muscle preparation is briefly de-scribed as follows: The toad brain was pithed with a blunt seeker at a point of depression, the toad was laid on the dissecting board with dorsal surface uppermost, the urostyle was removed then the sciatic nerve on either side was exposed. A long longitudinal incision was made along the skin fold over the thigh exposing the triceps femoralis and semi-membranous muscles. With the help of a glass seeker, muscles were separated and sciatic nerve along with its corresponding blood vessels was revealed. The sciatic nerve was exposed by cutting through the pyriformis muscle and then traced with the help of the glass seeker proximally up to their termination in the gastrocnemius muscle. Then, the vertebra was bisected diagonally into two symmetrical halves without disturbing the root of the sciatic nerve. The sciatic nerve was raised up and its branches cut off. Circular and longitudinal incisions were made on the skin over the tendo-achillis and gastrocnemius muscle, respec-tively in order to peel off the skin over this muscle. The tendo-achillis below the ankle joint was cut off and the tendon along with the freed gastrocnemius muscle was lifted up to the knee joint. The head of the tibia and the lower end of femur were cut off. The freed sciatic nerve with spinal attachment on one side and the muscle close to the knee joint on the other side were lifted from the body and placed in Ringer solution. The Ringer Solution has the following composition in mmol 1-1.. NaCl 119, KCl 4.7, CaCl2 1.6, NaHCO3 14.9, glucose 11.5. The Ringer solution was bubbled with 95% O2 + 5% CO2 gas mixture and the temperature and pH was kept at 37°C and 7.4, respectively. The nerve-muscle preparations was attached to Ugobasil force transducer (FT) cat 7006, which was coupled to a model 7070 Gemini two channel polygraph for the re-cording of isotonic contraction. The nerve-muscle under a passive tension of 5g was equilibrated for a period of 60min, during which it was stimulated twice with rectangular pulses (frequency of 30Hz duration of 1mSec) and at submaximal voltage for 3 sec. After 60minutes equilibration period, cumulative concen-tration response to nicotine, (FP) and (MP) of cow urine concoction was carried out. The data were presented as Mean + SEM, and student’s t-test was applied to assess statistical significance of the difference . P value of 0.05 or less was taken as statistically significant. In this study, dorsal approach method was used for the sciatic-gastrocnemius nerve-muscle preparation, instead of the conventional method of ventra approach. The objective of this method is to minimize blood loss, abdominal visceral is not disturbed and an intestinal content does not come out to spoil the nerve and the nerve is least damaged . Electrical stimulation of isolated nerve-muscle preparation was used for studying the release of neuromuscular transmitters and its pharmacological control. Isolated electrically stimulated preparations have been proven very suitable for pharmacological investigations . In this study, only non-lethal volumes of FP and MP of cow urine concoction CUC was used . The result of the present study shows that nicotine potentiate the contraction of skeletal muscle in a dose-depen-dent manner. Nicotine increased the period of contraction gradually from the basal level, to the highest at a dose of 0.8mg/ml with 25% increase compared to the basal value. Further increase in the dosage of nicotine (above 0.8mg/ml) produced corresponding decrease in the contraction period. 14.0mg/ml produced 63% decrease (Fig. 1a). Similarly, FP of CUC increased the average contraction period from 4% to 8% when its dose was increased between 0.05 to 0.1ml and the subsequent increase from 0.2 to 0.4ml led to an increase in contraction period from 20% to 85% until maximum period was obtained at 0.5ml (i.e. 96%) (Fig.1b). This was insignificantly higher than the contraction period observed with nicotine. MP of CUC first increased the contraction period from 7% to 19% with the increase in dose from 0.05 – 0.1ml and at a dose 0.5ml, the period decreased by 30% (Fig.1c). The normal relaxation period as recorded was 0.072 sec, while the maximum period of its relaxation was increased by 15% at a dose of 8.0mg/ml of nicotine. Further in-crease of dosage from 10.0mg/ml to 14.0mg/ml decreased the period of relaxation from 53% to 14% (Fig.2a). Similarly, at 0.00ml of FP of CUC the relaxation period was 0.064 sec, which was increased to 17% with a dose of 0.4ml. With the MP of CUC at 0.05ml, the relaxation period decreased by 38%, this is the least period of relaxation (Fig.2c). The normal height of contraction obtained was 2.5+ 0.03cm at concentrations of 2.0 – to 6.0mg/ml of nicotine. The height was increased from 5% to 56% and the maxi-mum height of contraction of 78% was obtained at a dose of 8.0mg/ml. 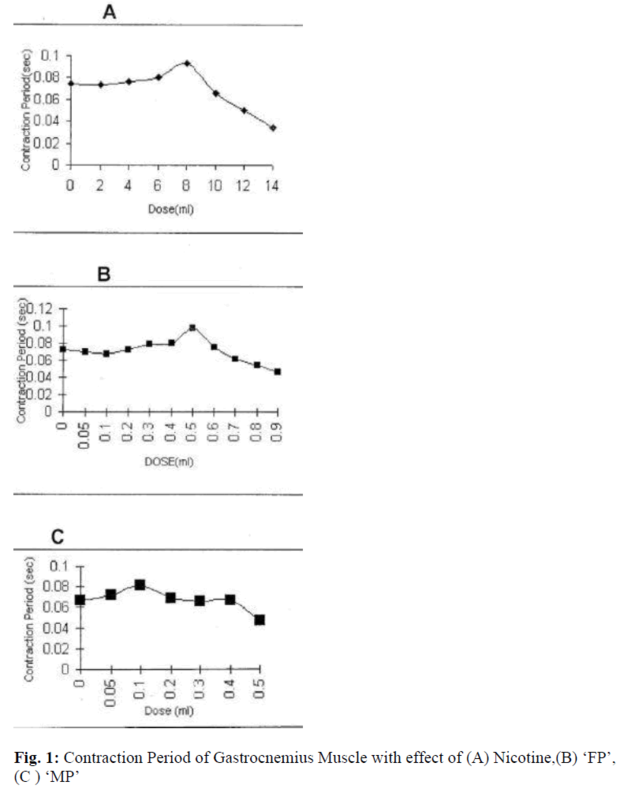 Subsequent increase in dosage from 10.0 to 14.0mg/ml caused a decrease in the height of contraction from 88% to 5% (Fig.3a). Similarly, FP of CUC at a dose of 0.4ml caused an increase in height of contraction by 72%, and the maximum amplitude of contraction obtained was 85% at 70ml (Fig. 3b). MP of CUC at lower doses of 0.05ml to 0.1ml caused an increase in the amplitude of contraction corresponding to the amount of drug added (Fig. 3c). At a dose of 8.0mg/ml of nicotine, the muscle preparation did greatest amount of work. However, further increase in the dose (above 8.0mg/ml) led to a gradual decrease of work done by the muscle (Fig. 4a). FP of CUC increased the work done by 73% at 0.4ml and it was increased to 86% at 0.5ml (Fig.4b). With MP of CUC, the work done by the muscle was higher at a lower dose, an increase in dosage however decreased the work done (Fig. 4c). One of the major findings of this study is that the response obtained from the effect of FP of CUC on the nerve-muscle preparation is very similar to that obtained in case of nicotine. FP of CUC at a low dose stimulated the muscle contraction and increased the work done while at a higher dose there was blockage of contraction, the contraction was higher in FP compared to nicotine but was not significant. This indicates that the skeletal muscle has almost the same sensitivity in response to both the nicotine and FP of CUC, which obviously shows that they have something in common, that stimulates the muscle. A second major finding is that effect of MP of CUC on neuromuscular junction is not similar to both nicotine and FP of CUC. At the onset of the experimental study, there was an increase in the height of contraction and work done, respectively, but when the dosage was increased, the contractility was brought down to the lowest level. 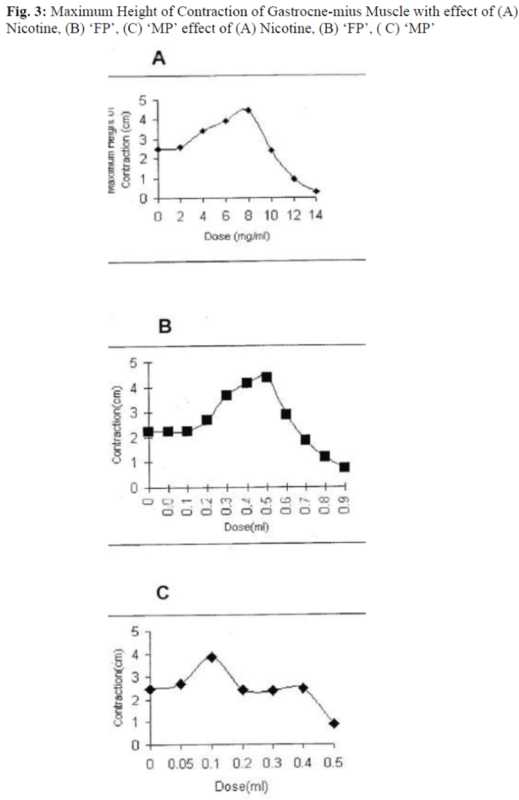 This indicates that the muscle behavior does not reflect the graded dosage added, probably because there is no stimulant (nicotine) to act on the nicotinic receptors at the neuromuscular junction, in response to different doses of MP of CUC used. A component of CUC, the nicotine from its tobacco leaves is most probably responsible for the effect of FP in this study. The effect of MP (with the absence of tobacco) on muscle contraction height and work done therefore correlates this observation. It is a well-established fact that acute exposure to nicotine exerts positive regulation of neuromuscular transmission by the activation of pre-synaptic auto-receptors at developing synapses, and a spontaneous Ach release may play an important role in synapse maturation. Many of spontaneous synaptic potentials are capable of eliciting action potentials and contraction [11,12]. In addition, nicotine has long been known to interact with nicotinic acetylcholine receptors (nAchRs) since Langley used it extensively to chart sympathetic ganglia, a century ago . The nAchRs exist as a diverse family of physiologically important ligand-gated-ion channels active in classic excitatory neurotransmission and they are ideal target for the regulation of nervous system functions [14,15]. These nAchRs are also the targets of nicotine, which acts acutely like acetylcholine to stimulate nAchR functions [16,17]. However, nicotine receptor activation appears to be short-lived and time-dependent, with a decrease in the functional responsiveness to acute and brief nicotine agonist exposure [18,19]. It was observed in the present study that the response of neuromuscular junction to initiate contraction was decree-sed with higher doses of FP. The implication of this observation is that an increase in the dosage of the FP decreass the nAchRs sensitivity and function, i.e. nAchR “desensitization”, which descriptiv-ely refers to as a rapid-in-onset, with quick and full reversible loss of function during or following a brief second exposure to nicotine. This observation was supported by several reports [20-24]. Conversely, chronic exposure to nicotine has been shown to be capable of direct inhibition of nAchR functions leading to the specific chronic stable desensitization, a functional down-regulation, long-lasting inactivation and persistent inactivation.Available evidence has shown that muscle type and ganglionic nAchR subtypes undergo more than one or more phases of functional inactivation upon sustained exposure to ni-cotine [18,25,26]. Various mechanisms have been proposed for desensitiza-tion. Most commonly implicated is defects of the voltage-gated Ca2+ channels and depletion of adenosine triphos-phate (ATP). Nicotine stimulates the release of Ach and contraction of the muscle and increases the sensitivity of the muscle to Ach released thus increase the contraction of the muscle. The excessive muscle contraction compresses local sen-sory nerves, which reduces the axoplasmic transport of molecule that inhibits Ach release . The sustained muscle contraction also compresses local supply of oxygen. This impaired circulation, combined with the increased metabolic demands generated by co-tracted muscles results in a rapid depletion of ATP . The resultant ATP energy crisis triggers presynaptic and postsynaptic decompensations. In the nerve terminal ATP directly inhibits ATP powered Ca2+ pump, which returns calcium to the sarcoplasmic reticulum [27,28]. Thus, loss of ATP impairs the reuptake of Ca2+, which increases contractile activity- a vicious cycle. The release of Ach depends on the calcium ions concentration in the ∞ motor nerve terminal. Excessive release of Ach may be caused by defects of L- type and N- type voltage- gated Ca2+ channels. An increase in Ach release decreases activation of nAchRs seen during the inactivation or desensitization of nAchRs. However, several other factors may be accoun-ted for changes in the level of measurable nAchR func-tion. Among these are enhanced/reduced conductances of each channel, enhanced/reduced frequency of channel opening, or longer/ shorter channel open time at neuro-muscular junction [29,30]. It is that nicotine influences the changes in the membrane lipid composition which may be affecting conformational equilibria of nAchR , elec-trostatic interactions , enzymatic carboxymethylation ,conformation changes , phosphorylation [35,36], endocytosis/exocytosis, or number of nAchR on the cell surface . The knowledge of nAchR subtype selectivity, rates of desensitization and persistent inactivation is needed for development of rational approaches for nico-tinic drug therapies in treatment of neuropsychiatric dis-orders. It is therefore, reasonable to conclude that the effect of FP on the skeletal muscle in the present study is due to the presence of nicotine in tobacco leaves plus other constituents in the CUC. The effect of FP of CUC in this study can be employed clinically in some disorders of the nerve-skeletal muscle system, like muscular weakness and hyper-excitability of the nerve-skeletal muscle system, seen in children con-vulsion. In children convulsion, the children used to develop muscular weakness, so FP of CUC could be used at a low dosage. At a high dosage, this will block the nAchRs and will bring about relaxation seen in convul-sion. Oyebola DDO, Elegbe RA. Cow urine poisoning in Nigeria Experimental observation in mice. Trop Georgr Med 1975; 27: 194-202. Atalabi O. Cow urine poisoning. Dokita 1964; 6: 1-4. Osuntokun BO, Odeku EL, Sinnate CH. Convulsive disorders to Nigerians the febrile convulsion. E Afr Med J 1969; 46: 385-394. Oyebola DDO, Adetuyibi A. Effect of variation in the quantities of constituent of CUC on its acute toxicity in mice. Trans R Soc Trop Me. Hyg 1977; 71: 349-350. Oyebola DDO, Adetuyibi A. Toxicity of modified preparation of Cow’s urine concoction in mice. Afr J Pharmacol Dru. Res 1979; 5: 65-69. Oyebola DDO Cow urine Concoction. Its chemical composition, pharmacological actions and mode of Lethality. Afr J Med med Sci 1983; 12: 57-63. Alada ARA. 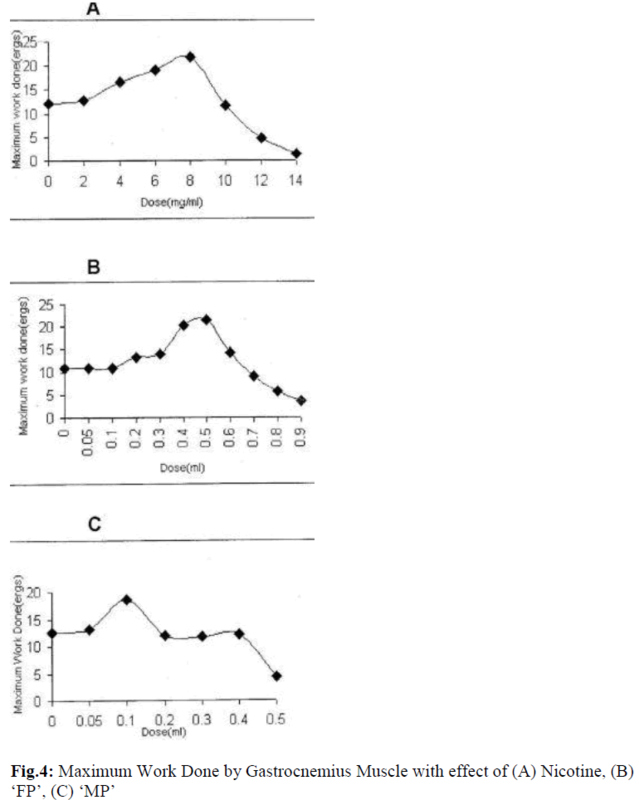 Effect of Cow urine concoction on the flow and composition of bile in the rat. Afr J Biomed Res 2001; 4: 47-50. Snedecor GW. Statistical Methods, 5th Edition, The Lowa State College Press, Amees, Lowas 1956; 52-62 . Dasgupta SR, Mukherjee JN. A simple Approach to the toad’s (Bufo melanostrictus) nerve- muscle preparation. Experientia 1954; 32; 5: 589-590. Hukovics. Isolated innervated organs as a particular method of pharmacology, Zbornik radovao Izaliranim Organima Akandemije nauki umjetnosti. Bitt 1980; 51: 11-29. Mc Gehee DS, Role LW. Presynaptic Ionotropic Receptors. Curr Opin Neurosci 1996; 6: 342-349. Xie Z, Poo MM. Initial events in the formation of neuromuscular synapse. Proc Natt Acad Sci USA 1986; 83: 73-79. Narahashi T, Fenster CP, Quick MW, Lester RAJ, Marszalee W, Aistrup GL, Sattelle DB, Martin BR, Levin ED. Symposium Overview: Mechanism of Ac-tion of nicotine on Neuronal Acetylcholine Receptors from Molecule to Behavior. Toxicol Sci 2000; 57: 193-202. Lindstrom J. Neuronal nicotine acetylcholine receptors in iron channels ed. by T Narahashi. Vol 4 Phenum Press, New York 1996; pp377-456. Lukas RJ. Diversity and patterns of regulation of nicotine receptor Subtypes. Ann NY Acad Sci 1995; 757: 153-168. Lukas RJ. Neuronal nicotine acetylcholine receptors in the nicotine receptor: Current Views and Future Trends Ed. by FJ. Barrantes Landes Bioscience, New York, 1998; pp 145-173. Lukas RJ, Norman SA, Lucero L. Characterization of Nicotine acetylcholine receptors expressed by cells of the SH – SY5Y Human Neurobastoma Clonal Line Mol cell NeuroSci 1996; 4: 1-12. Lukas RJ, Ke L, Bencherif M, Eisenhour CM. Regulation by nicotine of its own receptors. Grug Devel Res 1996; 136-148. Dani JA. Overview of nicotine receptors and their roles in the Central nervous system. Biol Psychiatry 2001; 49: 166-174. Katz B. Thesleff A. Study of the desensitization produced by acetylcholine at the motor end plate. J physiol (Lond) 1957; 138: 63-80. Choa EL, Li L, McNannee MG. Desensitization of central Cholinergic mechanisms and neuroadaptation to nicotine. Mol Neurosci 1990; 9: 251-267. Collins AC, Luo Y, Selvangs Marks MJ. Sensitivity to nicotinic and brain nicotinic receptors are altered by chronic nicotinic and mecamylamine infusion. J Pharmacol Exp Ther 1994; 271: 125-133. Michailescus S, Drucker Colin R. Nicotine brain disorder. Acta Pharmacol Sci 2000; 21: 97-104. Marks MJ, Grady SR, Collins AC. Dawn-regulation of nicotine receptor function after chronic nicotine infusion. J Pharmacol Exp Ther 1993; 226: 1268-1276. Kawai H, Berg DK. Nicotinic acetylchonic receptors containing alpa 7 Subunits on rat cortical neurons do not undergo long-lasting inactivation even when up-regulated by chronic nicotinic exposure. J Neuro Chem 2001; 78: 1367-1378. Lukas RJ. Effects of chronic nicotinic Ligand exposure on functional ability of nicotine acetylcholine receptors expressed by cells of PC12 rat pheochromocytoma or the TE671/RD human clonal line. J Neurochem 1991; 56: 1134-1145. Katsura M, Mohri Y, Shuto K. Up-regulation of L-type voltage-dependent calcium channels after long term exposure to nicotine in cerebral cortical neurons. J Biol Chem 2002; 277: 7979-7988. Giniahillin RA, Sokolova EN. ATP and adenosine inhibit transmitter release at the frog neuromuscular junction through distinct presynaptic receptors. Br J Pharmacol 1998; 839-844. Ke H, Eisenhour CM, Bencherif M, Lukas RJ. Effects of chronic nicotine treatment on expression of diverse nicotinic acetylene receptor, Subtypes. Dose-and time-dependent effects of nicotine treatment. J Pharmacol Exp Ther 1998; 286: 825-840. Gentry CL, Linchn H, Wilkins JR, Lukas RJ. Effect of prolonged nicotinic Ligand exposure on function of Heterologously expressed acetylcholine receptors. J Pharmacol Exp Ther 2003; 304: 206-216. Baenziger JE, Morris M, Darsant TE, Ryan SE. Effect of membrane lipid composition on the conformational equilibria of the nicotinic acetylcholine receptor. J Biol chem 2000; 275: 777-784. Song XZ, Pederson SE. Electrostatic interactions regulate desensitization of the nicotine acetylcholine receptor. Brophys J 2000; 78: 1324-1334. Kloog Y, Flynn D, Hoffman AR, Axelrod J. Enzymatic carboxymethylation of the nicotine acetylcholine receptor. Biochem Biophys Res Commun 1980; 97: 1474-1480. Baenziger JC, Chew JP. Desensitization of the nicotinic acetylcholine receptor mainly involves structural changes in solvent-accessible regions of the polypep-tide backbone. Biochemistry 1997; 36: 3617-3624. Fenster CP, Beckman ML, Parker JC, Sheffield EB, Whitworth TL, Quick MW, Lester RA. Regulation of alpha 4 beta 2 nicotine receptor desensitization by cal-cium and protein kinase C. Mol Pharmacol 1999; 55: 432 – 443. Hsu YN, Edwards SC, Wecker L. Nicotine enhances the cyclic AMP-dependent protein kinase-mediated phosphorylation of alpa subunits of neuronal nicotinic receptors. J Neurochem 1997; 69: 667-675. Peng JH, Eaton JB, Eisenhour CM, Fryer JD, Lucero L, Lukas RJ, Properties of stably and heterologously ex-pressed human alpa 4 beta 2- nicotinic acetylcholic re-ceptors (nAchR) Soc Neurosci Abstr 1999; 25: 1723.